Follo wing up on the children’s on-going interest in exploring shapes and patterns with pattern blocks –thinking about how shapes can be combined to form new shapes, and thinking about the patterns that result from careful placement of shapes – teachers decided to present a printing experience that could continue and deepen these conversations and investigations. During an art enrichment afternoon, teachers and children began by comparing a variety of shapes, noting the number of sides on each, and their relative sizes. It’s important as children develop their mathematical thinking to assure that they have the language to express their ideas, and this group conversation clarified what children have already noticed about shapes. The children were fascinated as they thought together at the words they knew. For example, the word triangle, with 3 sides, starts just like the word tricycle, with 3 wheels. Since a bicycle has 2 wheels, does that mean “bi” has something to do with 2? After this discussion, the children looked together at a variety stencils – one with a variety of triangles, another with a variety of rectangles, and a third with circles. To create prints, each child would choose complementary colors, and see how these shapes would look when laid out on top of each other. There were problems to be solved as the children began, and new discoveries to be made. One child used very deep colors, and there was a concern that the first colors wouldn’t dry quickly enough for a good second color. Paper towels were used to blot some of the extra paint, and the result was some really interesting textures to explore. In some cases colors looked different than anticipated because the background paper wasn’t white. When colors overlapped mixing occurred, with new colors apparent. When a teacher held up one child’s work so that she could look it over at some distance, she said, “I can see the shadow of the triangles that were there before!” Each placement, the order in which shapes were added, the color choices, all led to new discoveries to talk about together, and this added to the children’s sense of excitement and engagement in the process of creating. During the following art enrichment afternoon, the teacher showed children how shapes can look different depending on their placement. Flipping a triangle, or using different colors for the shape or it’s background can lead to very different results. 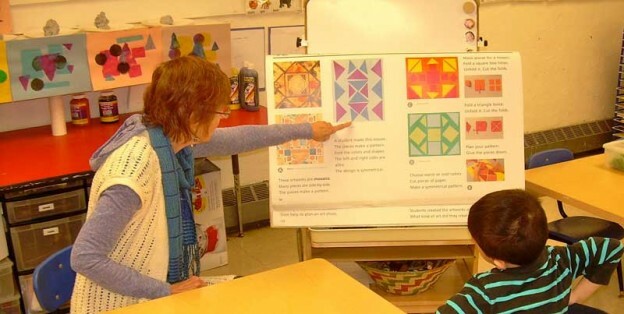 If you think about the patterns and colors in patchwork quilts you’ll have a good sense of what the children and teachers were thinking about together. The children’s creative process followed, when they cut smaller shapes from larger ones, chose their own colors, placed their shapes in relation to each other, and then glued everything down for a finished piece. Every approach was different, so in this experience, just like the first week’s, there was lots to talk about together, many comparisons to make, and problems to solve. The children haven’t lost interest in these investigations yet. Perhaps children will study one artist’s use of shape placement, and that will offer some inspirations for the children’s own creations. Perhaps they’ll try some mosaics or quilt patterns, both built from combining smaller shapes to create new patterns. Art experiences will continue to offer the children a language through which they can think about, investigate, talk about, and create with, the shapes and patterns they investigate in their environment. This entry was posted in Curriculum, Education and tagged children, curriculum, education, learning, project on January 18, 2015 by Katrina Selawsky.